Using an old chair frame to make a new chair, with some old crafting techniques. 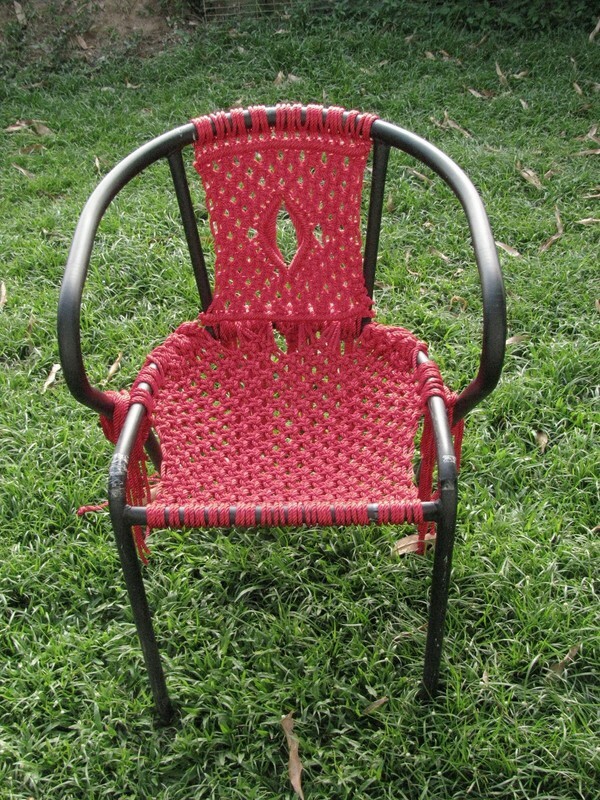 And some randomly donated rope you can try to make a chair too [for free]. NOTE: The measurements for the rope are over estimates for the size frame i was working on. It is mostly guess work. Links to the techniques used in [square brackets]. This project took about 3 days to complete,did not work on it constantly. Fist you get your self a chair frame. And a lot of rope, i used nylon rope as it is not itchy and it was randomly donated. Cut the rope in to 3 yard lengths. For this chair frame i needed to cut 16 pieces for the back of the chiar[each 3 yards]. Do this to all 16 pieces of rope. After attaching you 16 strands, do a series of double half hitches [http://www.free-macrame-patterns.com/double-half-hitch.html] as close to the top bar of the chair. That is the bar you looped the rope to. This is to give it some sort of structure and helps keep the rope even for knotting the rest of it later on. At this point you will most likely be getting a bit tangled with the rope. Also you will realize that nylon rope is rather slippery and not so great for staying in a knot. 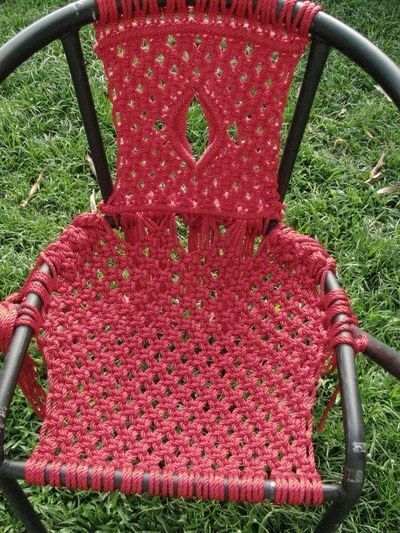 Remember that you are knotting alternating square knots around the diamond pattern.Making sure that the diamond is in the center of the chair. So keep a count of how many knots you made on the left side of the diamond and make sure the knots in the right side match up. After you have finished the section with the diamond pattern, continue doing the alternating square knots till you reach the end of the back of the chair. Then do another line of double half hitches, try to make them as strait as possible. 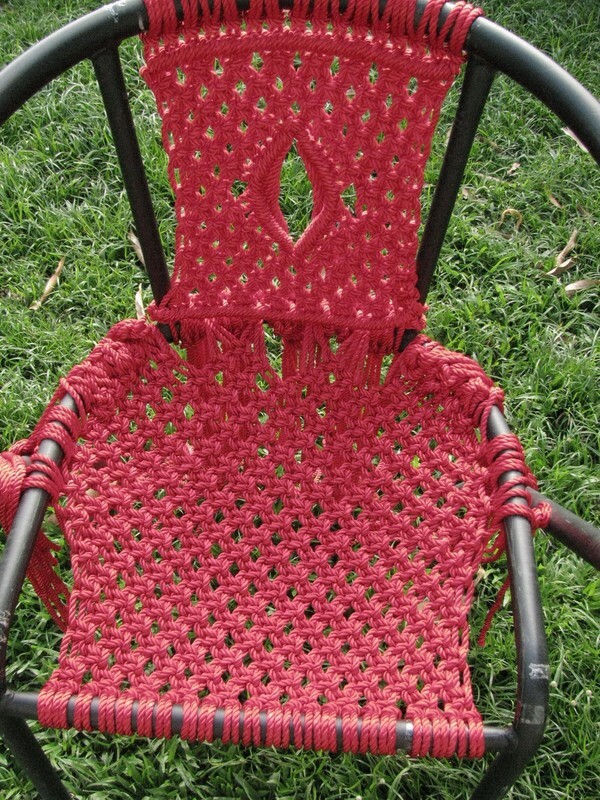 Then attach the end to the bottom rung of the chair. 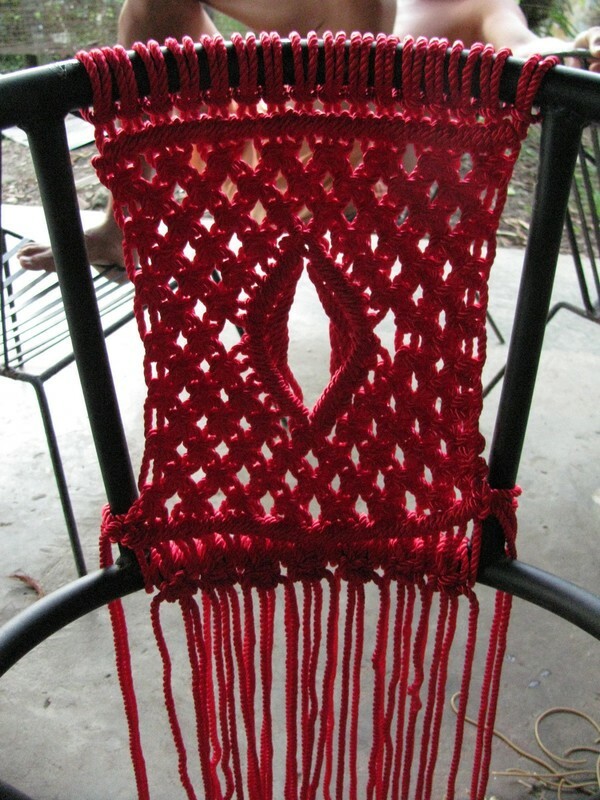 You can secure it with either a normal overhand knot [http://www.free-macrame-patterns.com/overhand-knot.html] around the bar. Then do an over hand knot with two strands. Pulling it as tightly as possible. Now on the the bottom/base of the chair. This part was tricky to fasten to frame, so do the same process as the top half. 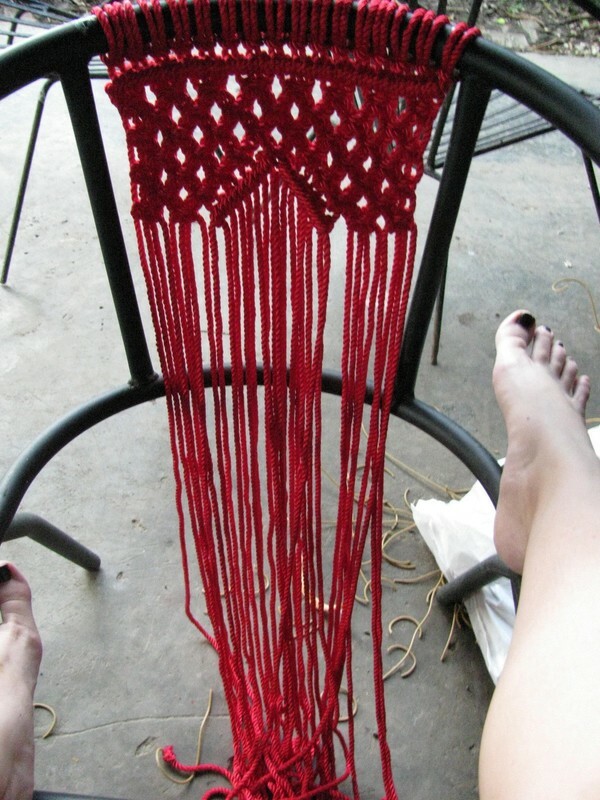 Do a lot of rows of alternating square knots [http://www.free-macrame-patterns.com/alternating-square-knots.html] till you reach the back of the chair. then attach it as you see fit, with an overhand knot around the surrounding frame. Just remember to trim the ends and use a lighter to seal the ends so they do not fray. I suggest you do that outside as the fumes from burning the nylon are not to be inhaled. Hi there, I have an old acapulco chair that needs to be restrapped. 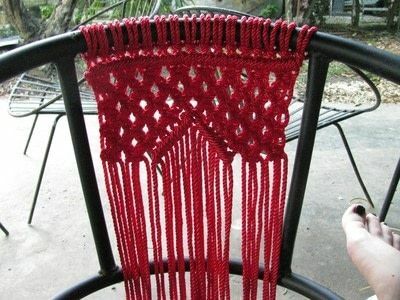 But, I would like to macramé it instead. I was wondering if you have any suggestions? Your chair is beautiful. I was thinking about the same design for my Acapulco chair. I am not sure as to how to end it or how much cord to use. Thank you for any help you can give me. This is amazingly intricate and cool. Very cool! How has it held up? I saw the preview picture and thought "Oh how cute!" Than I saw the whole thing, done, and thought "OH AWESOME!"